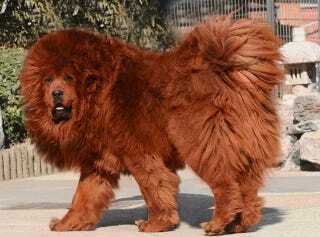 A Chinese zoo is under fire for trying to disguise a Tibetan mastiff dog for a lion. The twisted scheme began to unravel when the supposed "African Lion" started to bark. Top image: An example of the very lion-like Tibetan Mastiff. The zoo, which is located in the People's Park of Luohe in the central province of Henan, is notorious for replacing exotic animals with fakes. Three other animals were labeled incorrectly, including two coypu rodents in a snake's cage, a white fox in a leopard's den, and another dog in a wolf pen. A Tibetan mastiff dog is displayed for sale at a mastiff show in Baoding, Hebei province on March 9th, 2013. Credit: Ed Jones/AFP/Getty Images. According to the chief of the park's animal department, Liu Suya, the zoo does indeed have a lion, but it's currently at a breeding facility. The dog, which belongs to an employee, happened to be housed at the zoo over safety concerns. A zoo patron named surnamed Liu wanted to show her son the different sounds animals made, but he pointed out that the animal in the cage labelled "African lion" was barking. "The zoo is absolutely cheating us," said Liu to the Beijing Youth Daily. "They are trying to disguise the dogs as lions."